Treat your dog to the taste of the outdoors with Prairie Dog Moose Antlers Dog Chews. Every dog will enjoy chewing on the variety of shapes and flavors Prairie Dog has to offer as each provides a great taste and texture for dogs of all shapes and sizes. Prairie Dog antlers are North American antlers that are naturally shed or harvested and are Grade A and B, meaning they are the highest quality product on the market today. Prairie Dog utilizes an 11 step quality control process to ensure your dog is receiving the best and safest antlers on the market and always remember to supervise your pal while using antler treats. Bring the taste of the ranch home to your pup with Prairie Dog—your furry friend is going to love it! 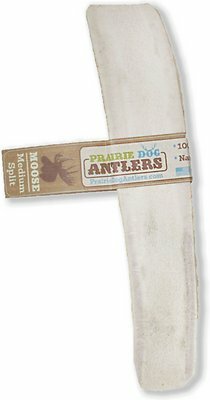 Prairie Dog selects only A and B quality antlers, which means they retain more of their natural moisture for a more palatable chew that won’t splinter or crack. 100% natural single ingredient treat made without fillers, by-products, artificial colors or flavors and contains phosphorus to support healthy bones and teeth. 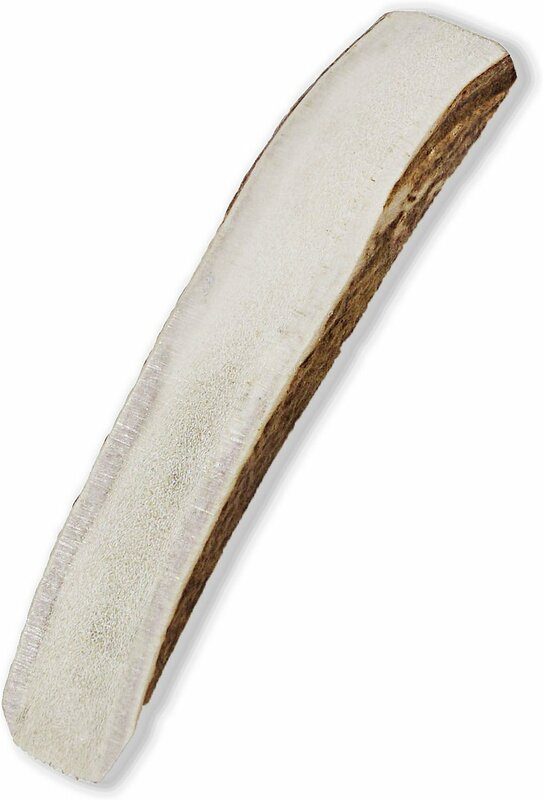 Strong and long-lasting North American antler is naturally shed or harvested in the USA. Sturdy antler encourages healthy teeth and gums by reducing tartar and plaque buildup all while freshening breath. Free of dyes and preservatives for your pup and to prevent stains on your furniture and carpet. Antler Chews Are Made from 100% Natural Moose Antlers That Are Shed Each Year. Supervise use. Intended as a treat, not as food or for human consumption. Recommended size is slightly larger than your dog's mouth. Wash hands with warm water and soap after handling. Take antler away if it becomes small enough to swallow. Prairie Dog Antlers are North American antlers that are naturally shed or harvested and produced and packaged in Montrose, Colorado. These are the highest quality North American antlers on the market today thanks to an 11 step quality control process. 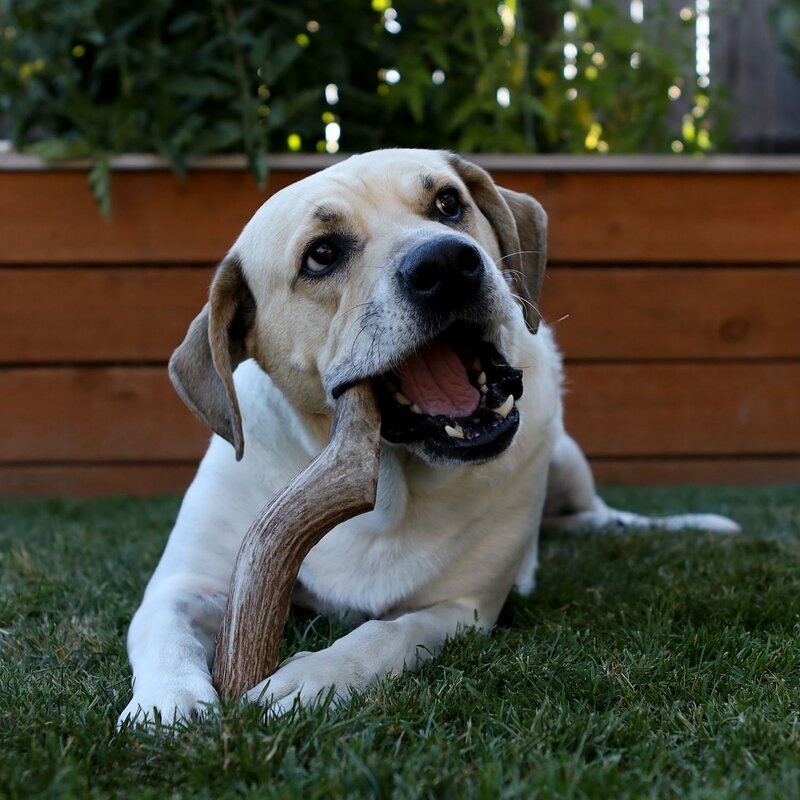 Prairie Dog Antlers provide a long-lasting treat that won't splinter or chip and helps clean teeth as your dog chews. Additionally, since they're free of dyes and preservatives, Prairie Dog Antlers will not stain furniture or carpet. Prairie Dog Antlers are available in several types, shapes and sizes. 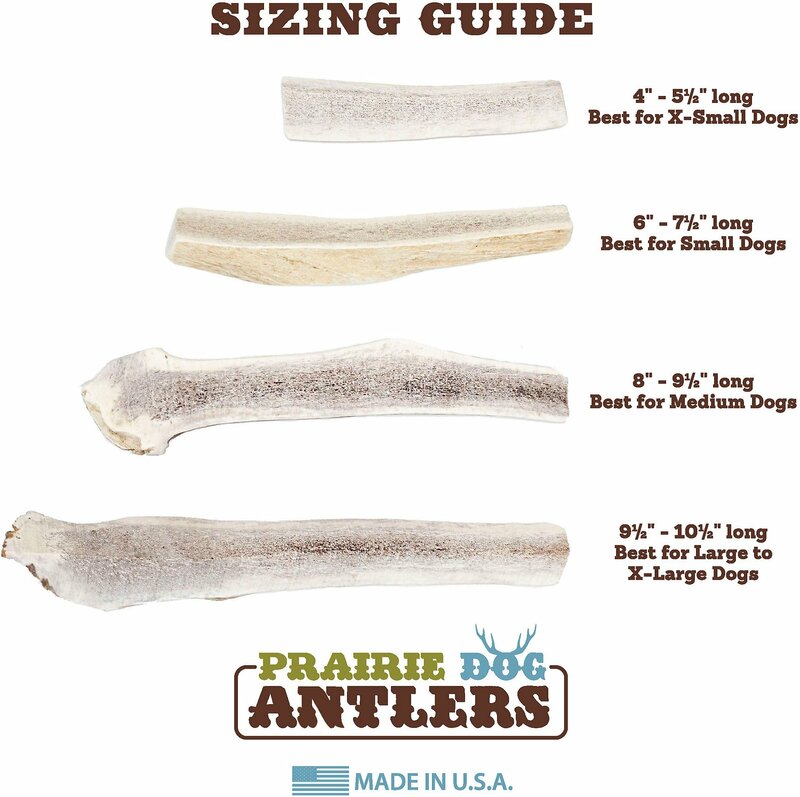 Choose from a variety of options like dense moose for a heavy chewer, a split elk for sensitive chewers, or a deer antler perfect for smaller breeds. Bear, our 120# Rottweiler, had an unbeatable record of chewing any treat to shreds in under 60 seconds (small disclaimer: the XXL Kong has proven to be a worthy opponent) so we didn't have high hopes for this Moose Antler. Well, color us impressed!! Even tho it doesn't have any doggie approved heavenly aroma, he loves it and has only managed to know off a little of the end so far. I'll be back for more eventually and found the cost to be very reasonable and affordable. We love Chewy and look forward to them adding a charity component to the sales platform so their shoppers can help animal rescues. We have a 15 month old lab puppy who loves antlers. Some times antlers can be chewed threw quicker than others. However, this was hands down the worst antler ever purchased. He broke off large hunks with one bite. There was not even an opportunity to gnaw around on it. I stick to deer and elk antlers. I’ve ordered several different types of antlers over the past for my med and large breed pups. I wasn’t impressed with these. They certainly appeared to be on the smallest size available as per description and they didn’t appear to have much marrow on them. My dogs love the split antlers because they can gnaw the soft center and the rough exterior. 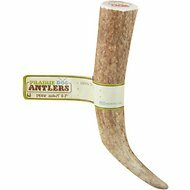 We have a giant breed and a power chewer these last a lot longer than any other antler (we have tried alot). We still have the ones we bought 6 months ago which is unheard of in our house. We bought the jumbo size and were very pleased, varied in sizes and shapes. Repeat very happy customers! ordered a large moose antler. Ive been purchasing these for years since I have had 6 different English Bull Dogs. I ordered large and it was marked ML and much smaller than others I have received in the pass.Im afraid to give it to my bulldog because it may be too small for her to use safely. I have been giving my pugs moose antlers for a couple years now (since I found out they are softer). I order a couple of these for a Christmas gift to my girls. These are the messiest moose antlers I've ever received. They are almost too soft. One of my girls was able to practically devour a whole one in one day because it just fell apart in chunks. Typically, these last several months. I'm really disappointed in the quality of these. I don't know if it is because I got them the large size? This slice of moose antler is much more solid than I thought it would be. Some of the reviews made it sound soft and brittle, but it is far from that, very solid and heavy. My Boxer loved it right away. He has two elk antler chews; one whole style and one that is sliced in half the long way. they are in various states of "chewdom" , but he won't touch them now that he has this moose antler. I don't know what makes one more attractive to a dog than another; perhaps texture or smell, or both, but he likes the moose antler a lot! Of course, he also liked the elk antlers when he got them, so who knows? I ordered 2 of these for my dogs. The size said "Large" and the 2 that I received are very small, MAYBE 4" long. I wont buy this brand ever again. It was a split antler which does not last long. My dogs went thru this in two days.